X-rays on site give the doctors at South Coast Medical Group an important look at the hard tissue within your body. As you probably know, this diagnostic tool helps medical professionals determine if you have a bone fracture or joint dislocation, but it can also help in the analysis of other conditions, such as arthritis. 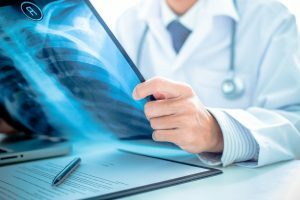 Men, women, and children or adolescents who live in Aliso Viejo, California, or the surrounding communities benefit from the convenience of having X-rays taken on site, without having to go to another facility. If the doctors suspect you have a bone injury, such as a fracture, an X-ray can confirm their suspicion. You might sustain a fracture due to a fall, a vehicle accident, a hard blow, or a sports injury. X-rays also can rule out a fracture and, therefore, help determine if an injury is muscular in nature, such as with a sprained ankle. X-rays are not able to show a soft tissue injury, like a muscle tear or tendon damage. Having X-ray services on site is exceptionally convenient if you come in for an urgent care appointment. The doctors can see if you have a fracture and treat it immediately. X-rays also help with the diagnosis of pneumonia and arthritis or to ascertain if your child has swallowed a hard object. Do I need any preparation for an X-ray? Usually, you must remove any metal objects, such as jewelry, that may obstruct the X-ray image. You are asked to remain still and to present the area to be imaged. In cases of an injury, this can be uncomfortable; for example, if you’re asked to bend or extend an injured joint. The technician may offer props to position the area to be X-rayed properly for the imaging. X-rays send radiation through your body to take images of the hard tissue. The radiation flows easily through soft tissue such as your skin, muscle, and fat. Hard objects and tissue, primarily bone, block the radiation beam and thus show up as white in the final X-ray image. X-rays do expose you to radiation, but the risk of such exposure is worth proper diagnosis of a bone fracture or other condition. The health care team at South Coast Medical Group will take only the images necessary so as to minimize your radiation exposure. If you’re pregnant, however, alert the technician because the radiation could harm the fetus.